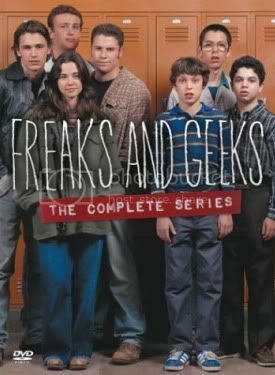 Geek Steal: Freaks and Geeks Complete Series DVD Set for Almost 50% off! For an indeterminate length of time, Amazon has Freaks and Geeks – The Complete Series DVD set on sale for $37.49, which is 46% off the retail price of $69.99. I’ve done the math (since I know how you hate to avoid long division on Thursdays), and that comes out to $2.08 per episode. That’s about the same price as a crummy iTunes download, but with better picture and sound, extras like deleted scenes and audio commentaries from cast and crew, and the pride of owning shiny discs to show off to all of your consumerist friends. Bingo, baby! This is the series that introduced the distinctive voice of producer Judd Apatow and a bunch of his regulars–including Seth Rogen, James Franco, Martin Starr, and Jason Segel–to audiences. So, if you’re a geek and love hilarity–and, since you’re reading Great White Snark, you are very likely (a) a geek, (b) fond of hilarity, and (c) a blog-reader of questionable repute yet impeccable taste–this is a no-brainer. Get Freaks and Geeks – The Complete Series on Amazon. Thanks to Pete at /Film for the tip. Wow, thanks for posting this! I’ve always wanted to watch this show but never did while it was on tv. Damn good deal.